"Winternight", the new video from VISIONS OF ATLANTIS, can be seen below. 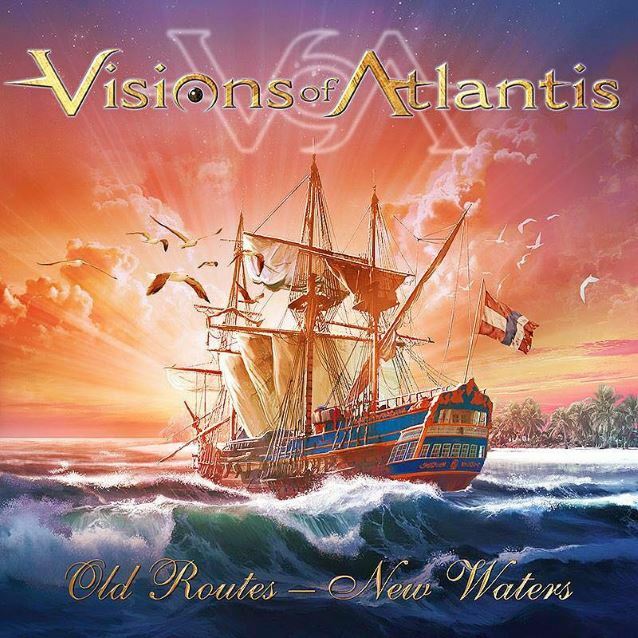 The song is taken from the band's new EP, "Old Routes - New Waters", which features fan favorites and classic moments from VISIONS OF ATLANTIS's first three albums, completely rerecorded, remixed and remastered. The EP was recorded, mixed and mastered by Frank Pitters at Silverlinemusic in Vienna, and was made available on April 29 via Napalm Records. VISIONS OF ATLANTIS set sails for uncharted waters in 2013. Thomas Caser — the band's only remaining founding member — completely overhauled the lineup with the vocal duo of Siegfried Samer and Clémentine Delauney, plus returning veterans Chris Kamper, Werner Fiedler and Mike Koren. Now, these reborn symphonic power metallers have only one thing on their minds: to revive the glorious sound of the band's first three albums, "Eternal Endless Infinity", "Cast Away" and "Trinity". Heralding an upcoming full-length album is "Old Routes - New Waters", which is described in a press release as "a thrilling glimpse of new shores awaiting these shellbacks." 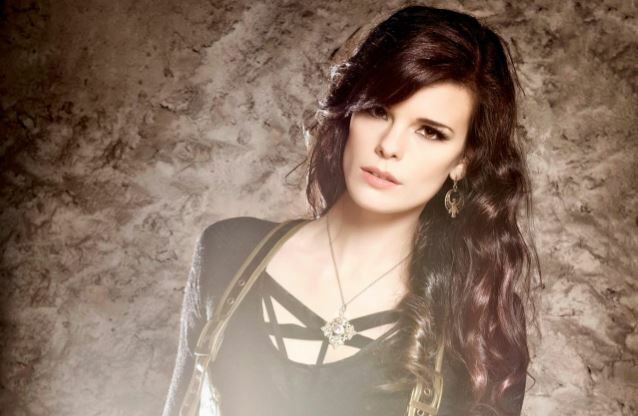 In a recent interview with Vixens, Delauney stated about how she first came to join VISIONS OF ATLANTIS as the replacement for her friend Maxi Nil: "It was very strange. I got an e-mail from VISIONS OF ATLANTIS that was strictly confidential, and they were telling me about the lineup changes. They asked me if I was interested to become the new front lady, and I didn't know if Maxi knew they were asking me. So, Maxi and I spoke to each other and we were waiting until the other one would start about this, not knowing how much the other already knew. We finally wrote each other about this and we ended up laughing about it. First it was a tricky situation — you don't want to make a mistake, and I felt uncomfortable with the situation. But when she started talking about it, knowing I was going to be the new front lady, it made it a lot easier. Everything went well. We are good friends. Maxi has no bitterness about VISIONS OF ATLANTIS. She did not want to go back to the classical roots, so it was her decision to be no longer part of the band." Regarding "Old Routes - New Waters", Clémentine said: "The idea about the EP was to make something for the fans, while they wait for the new record. My wish was to make new versions of old songs and to add a bit of my personal input into this EP. So it sounds different, a little bit refreshed. I did dare to sing in different ways. It can be very tricky to step into the shoes of different singers, especially when one has passed away [Nicole Bogner]. My favorite is 'Winternight'. It was a challenge, and it took me several attempts because I wanted to honor the original version, but at some point when the person is not there anymore, I did not want people to think I wanted to make them forget her. I had her on my mind the whole time I was recording that song. It was kind of weird, that process."